Today Julie Hall and Rockstar Book Tours are revealing the cover and an exclusive excerpt for DOMINION, book 3 in her Life After series, which releases March 20, 2018! 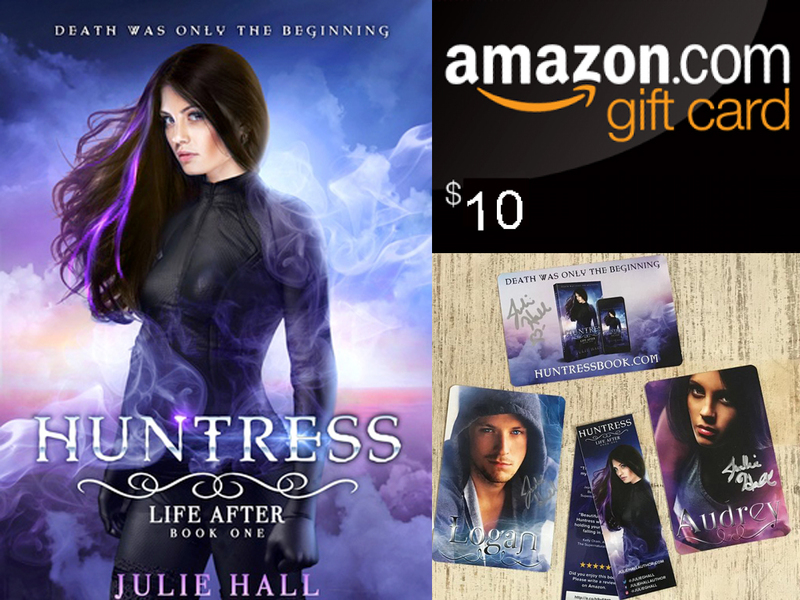 Check out the gorgeous cover and enter to win a Signed copy of Book 1 HUNTRESS, Swag, and a $10 Amazon Gift card! We sat on his bed, tucked up against the headboard, Logan sitting with one knee bent and an outstretched leg, and me curled into a ball against his chest, practically cuddled on his lap. When my tears were spent, I let out a shaky breath of air. I savored the warm thud of his heartbeat on my cheek for several seconds before what he’d said sunk in. The leakage from my eyes along with a bad case of the feels must have dulled my reactions. I jerked to a sitting position to stare at him in disbelief—and anger. My face was crusted with the salt of dried tears. There was no doubt I was a hot mess and a half. But that was nothing compared to the mess he’d just spewed. He reached for me again, but I put a hand up to ward off his movements and curled my upper lip. His face paled. I shouldn’t have gone there and instantly regretted bringing it up—but I couldn’t handle his concern for me when he had been tortured. We’d get to the “should never have bonded with you” comment next. “You experienced some of . . . of what I went through?” he asked. Buried under the caveman response was something sweet, but I wasn’t feeling it. 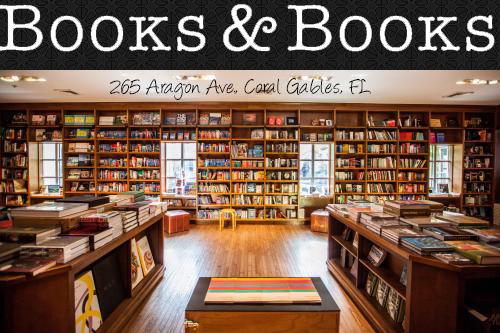 As I sputtered to find the right words, the corners of Logan’s lips just barely tipped up. I stopped talking when I spotted his involuntary reaction. Of course I’d find a guy who thought it was cute when I got mad. Actually, that was probably pretty lucky considering I did tend to have a short fuse. I pressed my lips together and narrowed my eyelids before performing another visual sweep of his body. Yep, he looked to be relatively healthy. I launched myself at him and grabbed the sides of his face, and then I planted my lips right over his. Just like the first time I’d surprised him with a kiss, he was momentarily stunned. I gently but firmly bit down on his full bottom lip in a silent demand for him to get with the program. Then I pulled back a fraction, just far enough that my lips grazed his when I spoke. “Less talking, more kissing,” I ordered. I’d gone to Hell and back for this guy. I wanted to collect my reward . . . with interest. 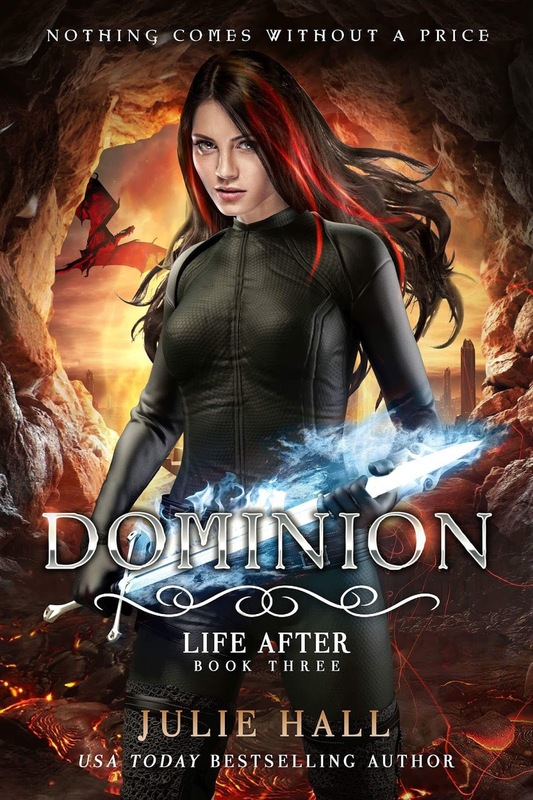 n award-winning, USA Today bestselling author of young adult fantasy fiction. 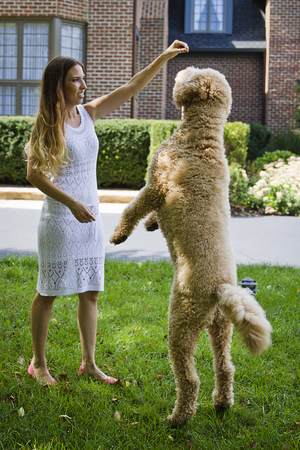 She currently lives in Portland, Oregon with her four favorite people--her husband, daughter, and two fur babies (because dogs are people too). Connect with Julie here, or on social media. 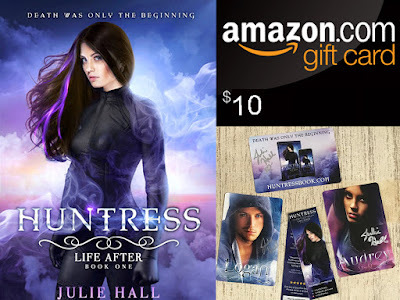 1 winner will receive a signed paperback of HUNTRESS, the first book in the series as well as LIFE AFTER series swag (signed character cards, magnets, bookmarks and stickers) and a $10 Amazon GC, US Only.